Fr. John “Fr. Jack” Brunner of Cold Spring died Tuesday, Oct. 23, 2018, at St. Cloud Hospital. He was 81. Mass of Christian Burial will be at 11 a.m. Tuesday, Oct. 30, at St. Andrew Catholic Church in Fairfax with visitation one hour prior to services. Bishop John LeVoir will officiate. Interment will be in St. Andrew Catholic Cemetery in Fairfax. A visitation will be held from 5-7 p.m. Monday, Oct. 29, at the St. Anthony Catholic Church Parish Center in Watkins. There will be a prayer service at 7 p.m. followed by the Knights of Columbus rosary. John H. Brunner was born Jan. 28, 1937, in New Ulm, Minn., to Henry and Honora (Young) Brunner. He grew up in Fairfax and attended St. Andrew Grade School, graduating in 1950. In 1954, he graduated from Crosier Seminary in Onamia, and he graduated from Benedictine University of Lisle, Ill., in 1958. Fr. Jack continued his education at St. Procopius Major Seminary in Lisle, graduating in 1962. He earned a Master’s Degree in Education in 1970, and he earned a Specialist Degree in Educational Administration in 1971, both at the University of St. Thomas in St. Paul. Fr. 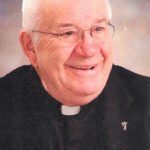 Jack was ordained at the Cathedral of the Holy Trinity in New Ulm Feb. 18, 1962, and he was assigned as Associate Pastor at St. Anthony Church in Watkins. From 1967 to 1972, he served as Principal at St. Mary’s High School in Bird Island. He then served as Pastor and Superintendent at Holy Trinity Parish and School in Winsted In 1983, Fr. Jack became Pastor at St. John’s of Searles and served as Superintendent at New Ulm Area Catholic Schools. He then served at Holy Trinity of New Ulm from 1988 to 1991 when he became Pastor at St. Andrew’s in Fairfax, Sacred Heart in Franklin, and in 2000 he became Pastor at Gibbon as well. In 2002, Fr. Jack returned to St. Anthony’s in Watkins where he served as Pastor until his retirement Jan. 12, 2014. Fr. Jack served on the Diocesan Education Committee for more than 20 years and on the Diocesan Priests Council for 16 years, serving four years as chairperson. He also served on the Diocesan Pension Committee and the Diocesan Land Committee. Fr. Jack was a member of the Catholic Order of Foresters and was appointed State Chaplain to the State Minn. Court and was elected to the State Court with voting rights. He also was a fourth-degree member of the Knights of Columbus and served as State Assistant KC Chaplain and State KC Chaplain. In his earlier years, Fr. Jack hunted elk, deer, and antelope in Wyoming and Canada for many years, hunting elk for the last time in 2001. He hunted moose in Minnesota once, but in Canada many times with the group from Winsted. He also hunted pheasant, and he hunted geese a few times in Churchill, Canada. Fr. Jack enjoyed golf and classic cars, owning several of them over the years. The cabin on Big Fish Lake, which Fr. Jack purchased with his brother James in 1964, was his biggest joy and main place for relaxation and retreat. Fr. Jack was preceded in death by his parents, brother James Brunner, nephew Mike Dragich, and brothers-in-law Don Schnichels, Dale Linnenkamp, and Bill Breitenstein. Arrangements are with Ertl Funeral Home in Watkins.